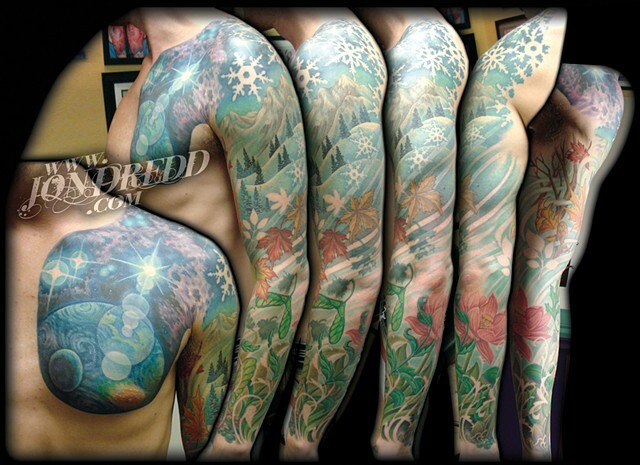 This Started out as the Earth from Orbit chest piece, and grew into a sleeve that depicts the different seasons as it flows downward from the shoulder. The main ideas we had from the start, but a lot of the details sort of evolved as we went, such as the negative space elements throughout the piece. The stars up top were the first of the negative imagery, and then the snowflakes in the space, shifting in to the winter scene seemed like a good transition. After that, the layered look that the negative shapes gave, really added complexity to the design, and working backwards down from Winter, Fall, Summer, and then Spring, made sense. Although, most people who see this tattoo start at the wrist, at Spring, and go up through the seasons through Winter, and end up in orbit over the globe.